World Cup players Ali Krieger and Ashlyn Harris with Washington Spirit’s Crystal Dunn. When I scheduled lunch at Shaw’s latest hit restaurant, the Royal, with defender Ali Krieger, goaltender Ashlyn Harris and midfielder Crystal Dunn, I had no idea how fortuitous my timing was. Krieger and Harris, both members of the women’s World Cup team, have just returned from a month-long media tour following their championship, which included going onstage at a Taylor Swift concert, posing for a Sports Illustrated cover and a ticker tape parade through the streets of New York City. And then their Washington Spirit teammate Dunn informs me they are all leaving on an 8 a.m. flight the next morning to head to Boston for a game, which will be followed by trips to Chicago, Kansas City and Portland. Naturally, before we can even begin to talk soccer the conversation shifts to how to survive living out of a suitcase. How often do you travel in an average season? 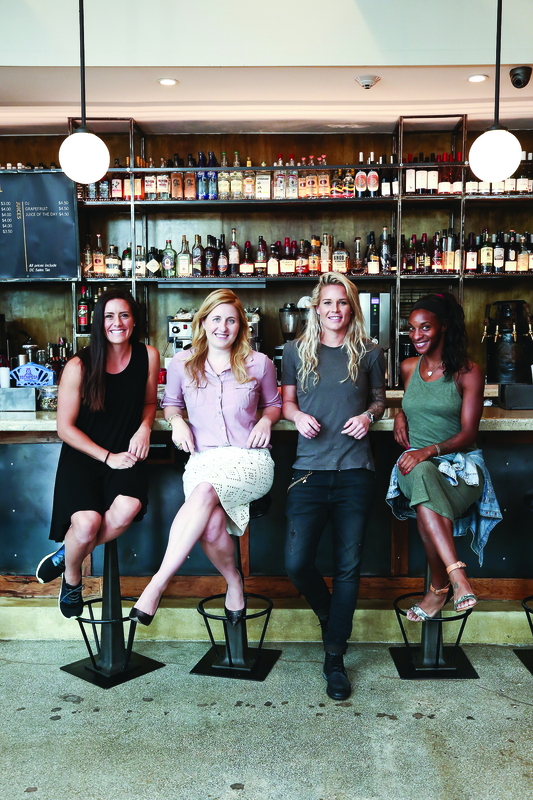 Crystal Dunn: We live on airplanes and in hotels. There are years when we have slept in a hotel bed more than our own bed. Ali Krieger: I’ve been in the same suitcase for six months. I swear. Six months. CD: It’s crazy, but it’s our life and we love it. Where do you like to spend time when you are in Washington? Ashlyn Harris: I like the Navy Yard the best. It’s super industrial and up-and-coming, but very clean and modern and a little different from the rest of the city. I kind of dig that style. AK: I love Georgetown with all the shops and cobblestone and row houses. AK: Because we are all on the national team we don’t really have a break until November and then we have two weeks in December for Christmas. If you’re only playing in the NWSL, you’d have from the end of September through March off but most of the players will go overseas to play to keep game ready, or they may have another job. Are the majority of the women on the national team also playing in the NWSL? AK: All but one. It’s important we all play in the league to bring attention to it and draw in fans. How is it different playing on the international stage versus locally? AK: Playing for your country is so much more intense than playing club, because you never know when you’ll have that opportunity again. Every single game, you never know if you’re going to be back, representing your country, your family, your friends. That’s such an honor. AH: You really can’t replicate playing for your country. Putting that jersey on and understanding the responsibility that comes with it and the people who have worn it before you, it’s pretty incredible. CD: You’re constantly being tested by the greatest players in the whole world, so it’s probably the most frustrating, but the most glorifying environment to be in at the same time. Where are your favorite international locations to play? AH: I was a real big fan of Australia. I got to surf there, go on some pretty incredible hikes, hold a koala and check out the kangaroos.To me, that stuff was pretty priceless. But I love Rio too. Clearly all my favorite places are going to be the cool beach towns across the world. CD: If there’s water, she loves it! AK: Mine was Germany. I had a long stint in Frankfurt with my home team. And I really miss it. It’s like my second home. CD: I love Japan. I think the people are amazing. They’re such a peaceful culture and it’s just so rare how they have taught themselves over these generations to be a peaceful nation. I also remember going in the parks and there were 98-year-old people just working out! How do you make yourselves a part of the community when you’re in a new place, whether you are just visiting or when you adopt a new city as home? AH: We have a lot more interaction with fans than most male sports figures. I think we have a responsibility to make intimate connections with fans. AK: Why do you think that is? AH: It’s because we have to work for people to come to our games. The men just show up and the fans are always there. There’s a culture around say the Nats of enjoying a hotdog and a beer and a good game. Ours is much more family-oriented. What is the future of the sport for women and where would you like to see it go? AK: Well, now I feel like it’s been a huge jump forward because we won the World Cup and the final was the most watched game in U.S. soccer history for both men and women’s soccer. We proved that we are worth watching and worth supporting. I feel like we’ve earned that and hopefully this goes to show FIFA that we are worth fighting for, we are worth paying attention to and supporting. AH: The question is now, how do we sustain that moment? AK: Especially at the club level. AH: Yeah. Like how do we keep selling tickets? We’ve sold out all three of our games we’ve played since we’ve been back. The buzz is there, but how do we keep that buzz? CD: I think media plays a huge role. The fact that people were able to watch the World Cup made a huge difference. In the NWSL, teams are getting some TV games, but if we can continue getting more games on TV, having more sold-out crowds, then people are going to be aware of our sport and be on board with progression. You’ve all accomplished so much at such young ages. But what are some of the goals you’re still working towards? AH: I think my next step is the normal life. I’d love to have a family and be settled a little bit. I don’t get that time to put into relationships and that is what I am looking forward to — the nice big family that I’ve always dreamed of and never had. AK: I agree, we put our career first and foremost and everything else goes on the backburner. But you come to a certain point in your life, after you’ve accomplished such a big dream its time to start focusing on the personal part of it. CD: Let me just say, I’m only 23 so there will be no babies anytime soon for me! I’m at the stage where I’m still trying to define myself through this sport. Our careers take off and theres no slowing it down. It’s about finding myself and getting better, growing as an athlete and working hard every day. Ali and Ashlyn, how has life post-World Cup been? AK: I think I speak for both of us when I say it was such a high, an ecstasy feeling that was so intense and emotional and incredible. And then after that it was just like OK, everyone’s got to go back home and that’s it; it was over. Obviously the momentum carries on for a bit but it was such a high that it was a bit depressing coming off that. Now we are adjusting to normal day to day life and adjusting playing with a team that we missed out on a for several months. That was probably the most difficult part. CD: I don’t know why they are pointing at me! We have such a great group that for me it’s like OK, cool, I can come out of my shell, not that I ever had a shell, and be myself. AH: She literally dances like no one’s around. AK: She’s the best part of walking in the locker-room. CD: I have to go with her too. I just saw Salt and she is so amazing in that. Love her. AK: I don’t know maybe Mila Kunis? If you could sit next to anyone at a dinner party, dead or alive, who would it be? AK: Either my brother or Oprah. CD: Will Ferrell or someone who is hilarious making everyone almost pee their pants at the table. AH: I would love to sit next to someone like George Washington, someone super old who was super influential. Especially during that time when life was super simple, I’d love to hear about it. See the story from the September 2015 issue here.